Klik! NavigationLib.Net is a set of User Interface controls/components designed especially to add sophisticated navigation features to your .Net Windows Forms applications. It consists of a total of 9 controls which each brings a revolutionary fresh new look and rich features to your applications. Each control in this library has advanced visual features which will make your application stand out from the crowd. NLTreeView, for example, supports node level visual adjustment and has header/footer parts. NLWizard allows you to change the style of every element it has. 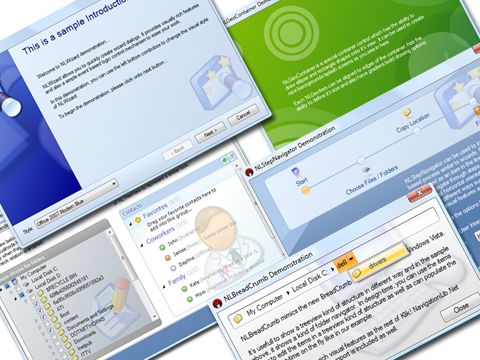 All controls have common advanced features such as gradient backgrounds, glowing text, shaped borders, image effects such as mirror and much more. Managable styles of controls allows you to change your applications look whenever you want with ease. Each control supports built-in Office2007 and Office2003 color schemes but anytime you can surpass this and use your own created styles easily thanks to StyleManagement feature of Klik! NavigationLib.Net. Furthermore, there are 7 ready to use styles incuded with the package which you can reach use Quick Access Menu associated with every control/component and are named as Office 2007, Office2003, CoolBlue, SoftXP, IceBlue, BurningRed and LiveGreen. All controls in this library are full of advanced features and shortcut methods to achieve most advanced navigational expectations. NLTreeView performs very smooth even with thousands of nodes loaded into it. It supports advanced check functionaility with support to CheckBox/RadioButton nodes and has built-in parent/child check relation. Databinding support makes it easy to load your treeview data from a datasource. Built-in Drag'n'Drop feature works without a single line of code for general scenarios. NLTreeNode class has built-in methods to do various actions such as moving the node into left, right, down and up. NLWizard provides a simple event based model where you can control actions on a page such as waiting for a process to complete, allow page movement only after some choices has been made and even you can skip pages depending on those choices. NLStepNavigator allows you to represent step based actions on a stepline, either in a vertical or horizontal layout and you can allow the user to click on choose the step to go. NLBreadCrumb allows to add the BreadCrumb functionality into your applications to easily navigate thorough tree kind of items structure. NLMessageBar allows you to show great looking message texts to end user in animated form and can also host controls on it. Klik! NavigationLib.Net is offered in 2 dlls which each targets different .Net framework versions as v2.0 and v3.0. Both dlls are optimized for their targets as well. The best way to see what our products does is to download and evaluate a trial version. Please click here to get the trial version of Klik! NavigationLib.Net v1.0 for Windows Forms. Although a Murphy rule says that no application can be bugfree, we don't have any update for Klik! NavigationLib.Net v1.0 for Windows Forms this time. Please check our site often for updates! Thank you for your follow up, I thought I was the only one that does follow up on a problem. Your suggestion worked just fine and I am using the product. I thank you for your prompt support and I am very pleased with my purchase.